LatinX Voices is the first undergraduate textbook that includes an overview of Hispanic/LatinX Media in the U.S. and gives readers an understanding of how media in the United States has transformed around this audience. Based on the authors’ professional and research experience, and teaching broadcast media courses in the classroom, this text covers the evolving industry and offers perspective on topics related to Latin-American areas of interest. 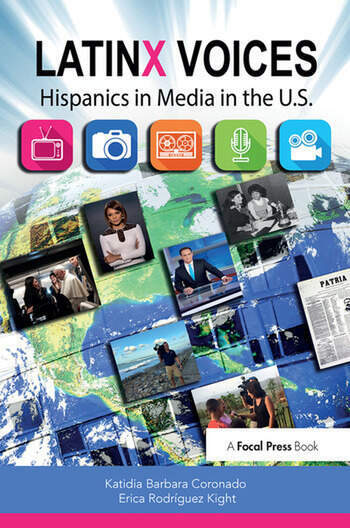 With professional testimonials from those who have left their mark in print, radio, television, film and new media, this collection of chapters brings together expert voices in Hispanic/LatinX media from across the U.S., and explains the impact of this population on the media industry today. Unit 1 - Immigration and the Emergence of Hispanic Periodicals in the U.S.
Chapter 1: Waves of Migration: A Brief History of the Hispanic/LatinX Presence in the U.S.
Chapter 5: El Ritmo Latino: Hispanic/LatinX Music Influences in the U.S.
Chapter 7: From Grassroots to Big Business: The Emergence and Development of Hispanic/LatinX Radio in the U.S.
Chapter 8: From Radio Stations to Television Networks: The Evolution of Spanish-Language Broadcasting in the U.S.
Chapter 11: Tapping into Hispanic/LatinX Buying Power: An Overview of Hispanic Marketing and Advertising in the U.S.
Katie Coronado, M.A., is a journalist and associate instructor of broadcast journalism, radio-television and Hispanic Media. After working in both English- and Spanish-language media more than 13 years, NSC appointed her to the instructor position in 2011. She currently teaches news writing as well as on-air delivery. As part of her commitment to educating the next generation of journalists, she launched the university’s first Spanish-language course. Knightly Latino, which offers students an outlet to cover issues of interest to the Latino community in both English and Spanish. She has also helped pave the way with the School’s Hispanic Media Initiative which includes the first Hispanic/Latino Media Certificate to help introduce students to work on air and behind the scenes in a multicultural environment. Coronado is also a NATPE fellow. Additionally, she participated and coordinated in the Broadcast Education Association’s first ever "Air Check en Español" panel at the NAB/BEA convention. She continues to work as a bilingual freelance reporter which helps her bring real-world experience into the classroom. During her free time she enjoys spending time with her family and traveling to new places. recognitions from Florida AP Broadcasters, the Society of Professional Journalists, and the Florida Emergency Preparedness Association. In her free time, Kight enjoys traveling and spending time with her family. LatinX Voices lends context to the fruits of Hispanics in American media. This carefully crafted book allows us to palpate the heartbeat of immigration, contemplate the seeds of generational efforts, and smell the rising dough of a media environment fueled by its diverse and tireless soul.